The whitewashed ceilings are gone along with the last century, and pasting them with wallpaper also no longer attracts anyone. Stretch and suspended ceilings look more modern and stylish, they are the most in demand. Therefore, in this material we will find out which ceiling is better - stretch or suspended, and for this we compare their main characteristics. Wallpapering, painting, tiling and other finishing methods require careful cleaning and leveling our surface ceiling. 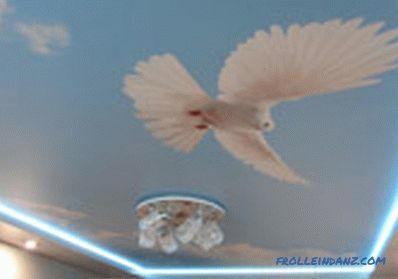 All operations for leveling and cleaning the ceiling are quite labor-intensive and require a large investment of funds. 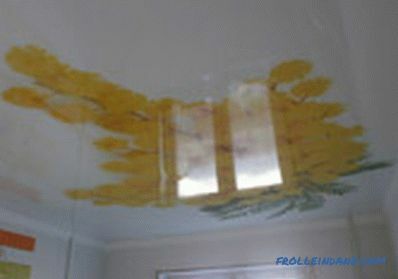 Otherwise, the paint will peel off, and the wallpaper or tile will quickly peel off. But the tension or suspended structure will not require anything of this - the surface is suitable for them any. So you significantly save time and effort. To install a suspended system, first build a metal frame on which the elements and modules of the ceiling are fixed. It may be slats, cassettes, plates, but at home most used drywall sheets. The frame consists of long guide elements, moldings (at the corners) and suspensions that regulate the height. Brackets, metal rods or wires of sufficient thickness are used as the latter. If the ceiling is hemmed with plasterboard, then at the last stage it is putty and painted. The tensioning system is fastened by harpoon, wedge or cam method on a baguette mounted on all sides of the room. For the installation of PVC canvas, the room is heated to 60 - 65 0 C. The polyvinyl chloride film, after cooling, stretches tightly, and a smooth, beautiful and shiny ceiling is obtained, which is not afraid of water and does not absorb extraneous odors. These structures are requested for ceilings in Soviet-built panel and brick houses, where the floor slabs are often have not very smooth joints. To equalize the drop, which can be from 3 to 7 cm. 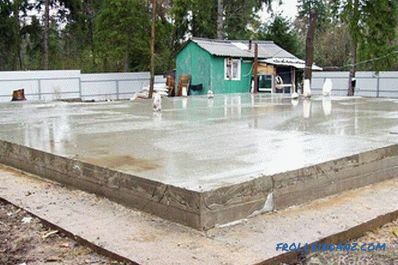 - it is labor-intensive and often it can only be done by an experienced master. But the tension or false ceiling perfectly masks the irregularities, and over them do not have to "conjure." 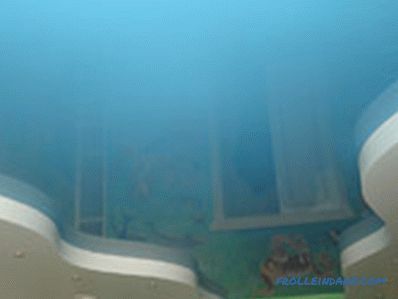 Another problem is the cleaning of the ceiling from the layer of old water-based paint. It is very hard to tear it off, but you cannot leave it - wallpaper, tile or paint of another type will not hold well. If you began to think about what a good spotlight to do in the ceiling, then stretch and suspended ceilings are ideal in this case. After all, inside this design, you can perfectly hide all the wires, and the lamps themselves will fit well. In order to decide on that stretch or suspended ceiling to be used indoors, you need to compare them on basic parameters. Since the most popular among suspended ceilings are PVC-based ceilings, and among suspended ceilings and gypsum ceilings, we compare them in basic parameters. Installing stretch ceilings on your own will not work and you will have to involve specialists. And they not only stretched the canvas, but also make it. 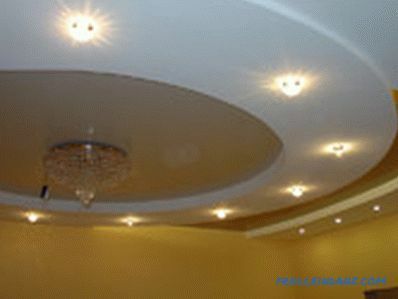 For the installation of such ceilings requires special equipment and experience in installing such structures. But for the work does not need to empty the room, a lot of garbage at the same time also will not. The process of installing suspended ceilings is inevitably associated with a large amount of building dust and debris. Most likely, you will have to remove all things from the premises and spend a lot of energy on cleaning the premises. But such a ceiling is quite possible to build their own hands, saving on payment of the works of masters. True, this is only possible if you are friends with a construction tool and carry out repairs on your own. If we talk about other types of suspended ceilings, then they will also take longer to install than stretch ceilings, and the installation process itself is also more “dirty” than when installing stretch ceilings. A standard stretch-type ceiling is mounted for about 3 to 4 hours (except for the ceiling versions simulating a starry sky). It will take from 2 to 4 days to manufacture the ceiling from drywall and this is the minimum. It all depends on the area, the complexity of the room and the ceiling itself. If the design is quite complicated (multilevel, for example), then it will take even more time. Stretch ceiling when attaching a baguette to floor slabs "steals" everything 3 - 5 centimeters height. 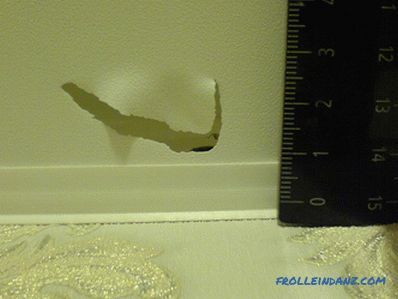 Well, a drywall construction will reduce the height of the room by 10 to 12 centimeters, no less. Some other types of suspended ceilings will take even more room height. It is especially important to take this into account in rooms where the height of the ceilings is already quite low. 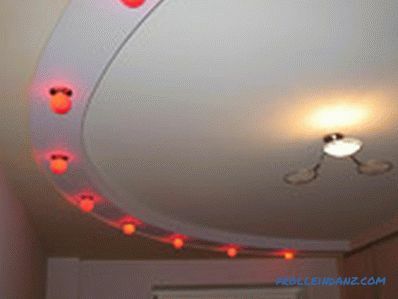 Hide wiring and lights under the tension-type ceiling is extremely easy. For spot lighting there are special elements - "glasses", rings and plates with heat insulating qualities, which are mounted in the canvas. If you need to replace lights or replace the lighting system, then it will be easy. However, wiring and fixtures fit well in the frame of the suspended structure. 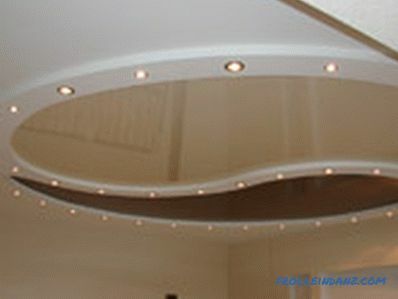 Therefore, deciding what is better - drywall or stretch ceilings, note that in this regard, they are almost equivalent. However, in a suspended ceiling it will be more difficult to get close to individual elements for repair. However, this problem is solved by hidden hatches. PVC fabric is very easy to care for - it will be quite grateful for periodic wiping its surface with a wet cloth. But the suspended plasterboard construction needs periodic "refreshment". In some cases, tinting may be required. 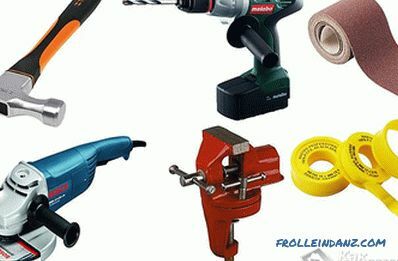 Pierce the PVC film with something sharp or hard - easy peasy. Holes can appear from anything — even from a shot from a child’s bow or a toy gun with plastic bullets. You can, of course, seal these holes, but this is not very beautiful, and security from the water will disappear. Drywall and other materials used in suspended structures are more durable, but they are afraid of strong blows and they are not worth throwing heavy objects at such a ceiling. Perhaps, on this point, our competitors are both worthy. Both one and the second types of ceilings do not sustain combustion. Therefore, they will not be able to burn from the fire, although they will be damaged. What do you think, in this case which ceiling is better - stretch or plasterboard? There is nothing to think about - of course, the first one. After all, PVC film is not afraid of moisture and is able to hold a certain amount of water on its surface. In the event of a flood, you can call the master, who will drain the collected water, after which in most cases the canvas will continue to function. Well, and if it flows on a suspended ceiling, it will flood the walls, and the floor, most likely. And the damaged sheets of drywall will have to be replaced - this material is afraid of moisture. The suspended ceilings are guaranteed for up to 10 years, but finishing work for their "refreshment" may be needed earlier. To embellish them most likely it is necessary before the expiration of 10 years. 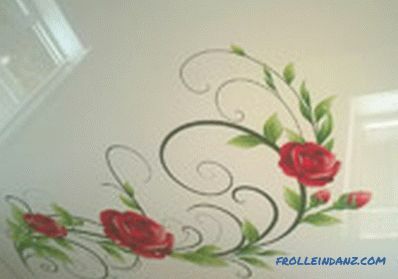 As for the ceiling of PVC film, the guarantee for it is from 10 to 15 years. 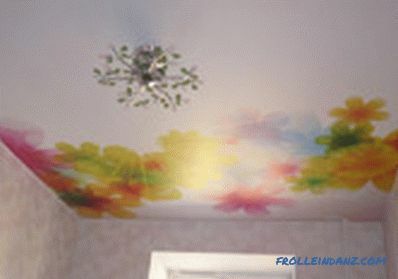 At the same time, no redecoration is needed before. PVC film is terribly afraid of cold - already at zero, it loses its elasticity, becoming fragile. And if it’s minus 20, the canvas just cracks. So you can not stretch ceilings where there is no heating (on the balconies, for example). False ceilings do not suffer from this - they can easily withstand temperature drops. Stretch-type ceilings can be almost as colored any It can be a bright or pastel monophonic color, a funny drawing or a reproduction of some famous picture. Fortunately, the method of printing allows you to embody all this. 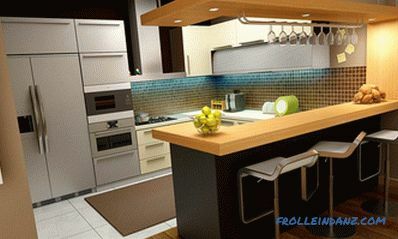 The choice of a glossy or matte surface is another way to diversify the design of a room. Well, and suspended ceilings can be arranged in differently, using wallpaper with different texture, paint or ceiling tiles. A ceiling of several levels in general looks very original. The color range here is simply extensive and endless. But to create, for example, a glossy surface here will not succeed. 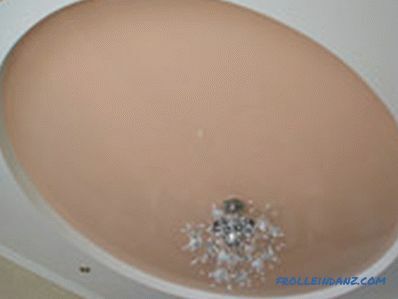 And which ceiling is cheaper - stretch or drywall? 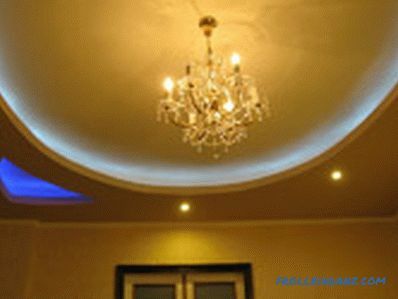 A suspended ceiling made of plasterboard will cost (per square meter) from 20 to 35 dollars. It should be noted that several levels will cost significantly more. 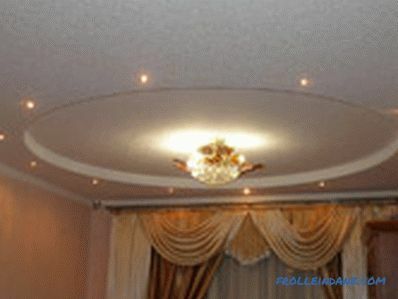 Prices for stretch-type ceilings are very scattered - from 10 to 100 dollars, per square meter. 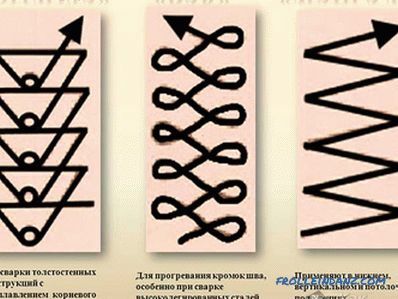 They take into account the number of corners in the room, as well as curved sections, bends, type of material and drawing on it. If you want to draw arches or convex figures, then the initial price will increase by one and a half times. And the ceiling with the original pattern is six times more expensive than a smooth monophonic surface. Easy Installation Professional attention is required. It is possible to make the installation yourself. Installation speed 3 - 4 hours. 2 - 4 days. Loss of height 3 - 5 cm. 10 - 15 cm. Embedding the Backlight Spotlights are installed without problems. Spotlights are installed without problems. Easy care The care is not demanding. Care is difficult. Resistance to damage Easily exposed to mechanical damage. Sufficiently resistant to mechanical damage. Flammability Does not sustain combustion. Does not sustain combustion. Moisture resistance Not afraid of exposure to moisture. Under the influence of moisture, a process of swelling and even destruction occurs. Durability The warranty is 10 years, and apart from wiping, it does not require any additional actions. Serves from 10 to 15 years and more, but requires repainting during operation. Operating temperature Does not tolerate negative temperatures. It can be operated both at positive and at minus temperatures. Cost from $ 10 to $ 100 - depends on the material and additional elements. from $ 20 to $ 35 - depends on the complexity of the elements and the method of finishing. 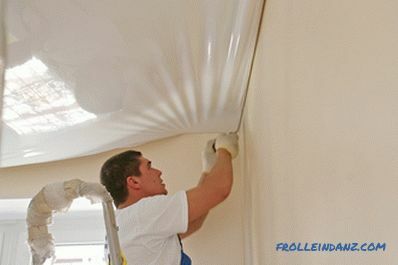 If the ceilings in your apartment have a small height and you absolutely do not want to lose the extra centimeters, then choose a stretching ceiling from a PVC film. The tension-type ceiling will be good in apartments under the roof of the house. After all, there leaks can occur with high probability. However, sometimes not on the upper floors in the room can be very wet. And then this option is perfect. 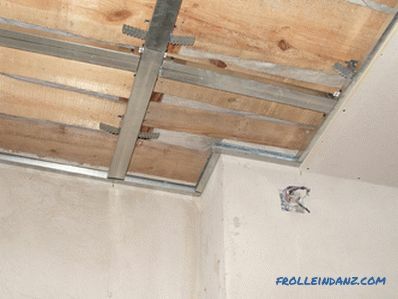 When mounting the ceiling in a country house, on a loggia or on a balcony, on the contrary, do not use a PVC tension structure - it will not stand cold weather Better make a frame by attaching plasterboard plates to it. 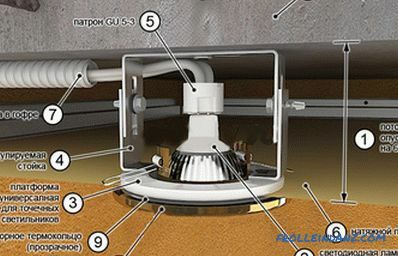 If you periodically need access to the space under the ceiling, then choose a suspended ceiling type - with the tension version of this access will not work. 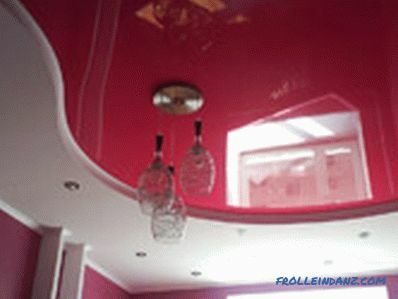 In the case of a limited budget, make yourself a suspended ceiling yourself. However, if you care about saving for a long time, then it makes sense to think about the tension version. After all, then 10 years - 20 years old you do not have to know worries. For those who can not decide what is better - suspended or suspended ceilings, we can offer an interesting option. Make a drywall construction, and in the middle insert a stretched vinyl film sheet. The ceiling will turn out original, beautiful, besides, in a sense, possessing advantages of both types. Photo examples of such ceilings, see below.